The inspection is an insight into the condition of the building, surrounding outbuildings, garage, garden shed, fences, retaining walls and pool. Any defects are identified and assessed for their possible effect on the integrity of the building and surroundings. A detailed inspection report including photos, is carried out in accordance with Australian Standard (AS) 4349.1-2007 and 4349.0-2007. 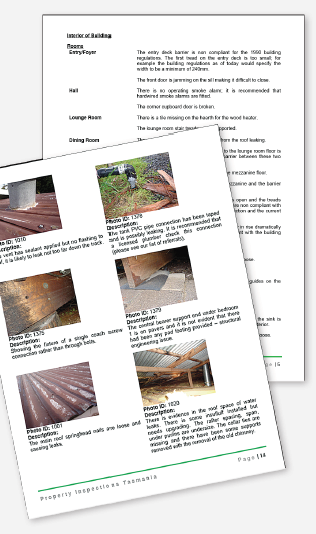 These standards specify the minimum requirements for a building inspection within Australia.